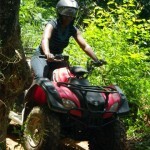 Swazi Trails are the main operators of quad bike trails in Swaziland. Our quad trail operation is situated in the central Ezulwini Valley area, close to most major hotels and lodges. The trail was purpose-designed purely for quad-biking and has been described as one of the most interesting all terrain vehicle or ATV tracks in Southern Africa. Known as the Devil’s Cauldron, the area was once an active tin mine in the early 1900’s, which is now re-forested. All that remains of the mine workings are deep gulleys, or as they are known locally dongas, which make for a challenging environment for quad-biking. There is hardly 20m of straight track, with twists, turns and corners being the order of the day. This is not a high-speed trail and most rides engage only 2nd and 3rd gear. Swazi Trails provide one of the most popular quad bike for commercial operations, the Suzuki Ozark LTF250. This powerful bike, with a semi-automatic clutch system is ideal for beginners, but also fun for more experienced quad riders. Trails are adjusted to suit the ability of riders. After an initial quick introduction to the quads and a few laps in the parking lot, the guide will determine which route to follow. For less-experienced riders the option exists to go out onto the wide open grass fields in central Ezulwini. This area, with less trees and gullies to avoid, is ideal for beginners. A typical trail takes approximately 1.5 hours to complete and rides are limited to 5 riders and a guide. For larger conference and incentive groups, multiple departures can be arranged with the interval between rides reduced to one hour.